Here is my dissenting report to the NSW Parliament Inquiry into gas supply and prices in which I highlight some areas where i think the committee could have been much stronger in its recomendations. The full report is available here. My media release on the report is here. I am pleased that the committee accepted the strong evidence presented that the development of coal seam gas in NSW will have no meaningful impact on the supply or cost of gas in NSW. However, given the significant risks that the development of a coal seam gas industry poses to water resources, the environment and public health, it is disappointing that the committee decided not to go a step further and recommend that the industry not be allowed to proceed in NSW. The NSW government should not risk public health, the quality or quantity of water resources or the nature of farmland and rural communities by developing an indigenous gas supply from unconventional resources. I am also concerned that the Liberal, National and Shooters Party members of the committee voted to prevent the important evidence given by NSW Farmers and Lock the Gate, that the risks and the widespread and determined community opposition to unconventional gas exploration and production cannot be ignored when examining issues which affect gas supply and pricing issues, being included in the final report. requires the disclosure of the details of gas export contracts to the government on a confidential basis, for those companies wanting to do business in NSW. To assist in the development of other sources of energy, the NSW Government should develop contingent legislation that provides a guarantee that in the event of any future change to the federal Renewable Energy Target, no renewable energy generator in NSW would be worse off. Further, that the NSW Government implement policies and strategies to facilitate a complete phase out of fossil fuels, including gas, for energy generation and other purposes by 2030. 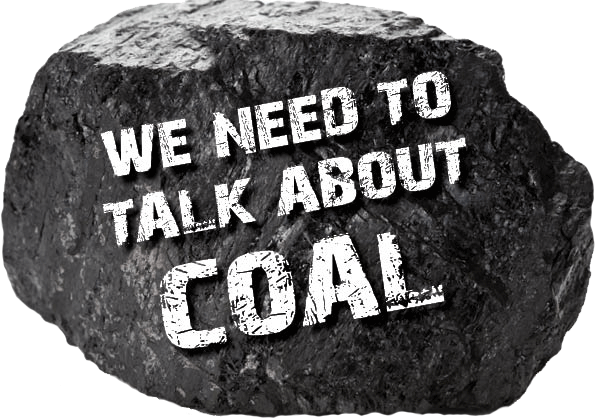 The NSW government should develop programs, policies and strategies that facilitate households, businesses, the public sector and industry transitioning from gas and fossil fuels to high efficiency energy use and renewable forms of local energy generation, including the provision of low interest loans, independent technical advice and benefit sharing schemes. low-income rental housing and the cost impacts for residents. The NSW Government should undertake detailed research into the barriers and opportunities related to disconnecting from gas for residential consumers, especially public and community housing tenants and low-income renters. The NSW Government should develop policies and programs to support to support improved energy efficiency by NSW households, especially dedicated support for low-income households. The NSW Government should provide NSW households with accurate information on the relative costs of electrical and gas systems for cooking, hot water heating and space heating, and encourage people to switch to efficient electrical systems where it is cost effective to do so. The NSW Government should facilitate identification and financing of energy efficiency and economic fuel switching alternatives to gas use in the commercial and industrial sectors. 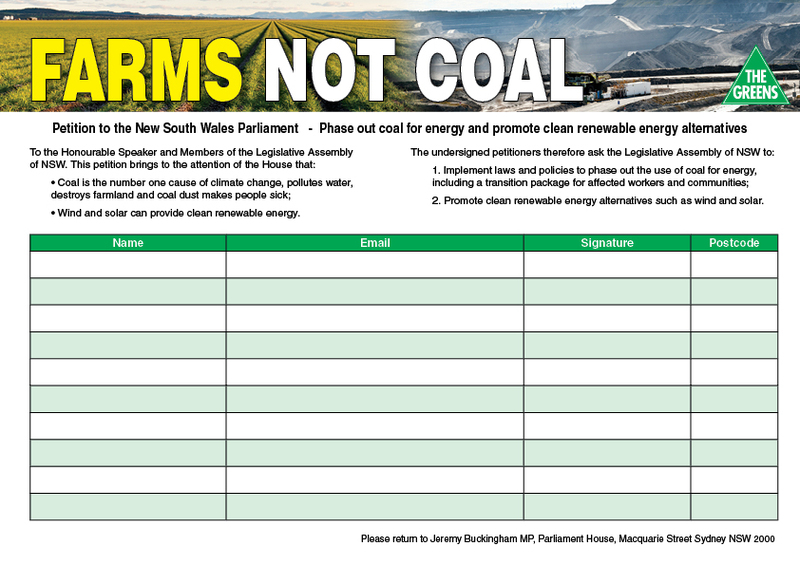 These are the answers of the Greens NSW to a questionaire sent by the fantastic campaigners at Stop CSG Sydney asking all political parties for their positions ahead of the upcoming NSW election on 28 March 2015. 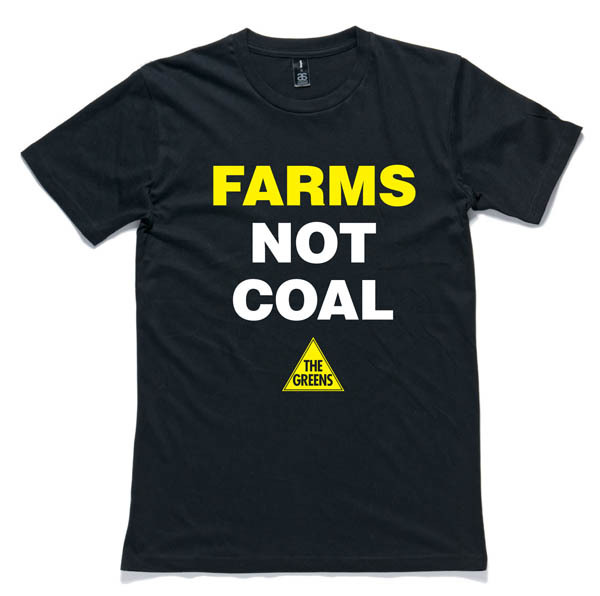 Do you support the coal seam gas industry being rolled out in NSW? 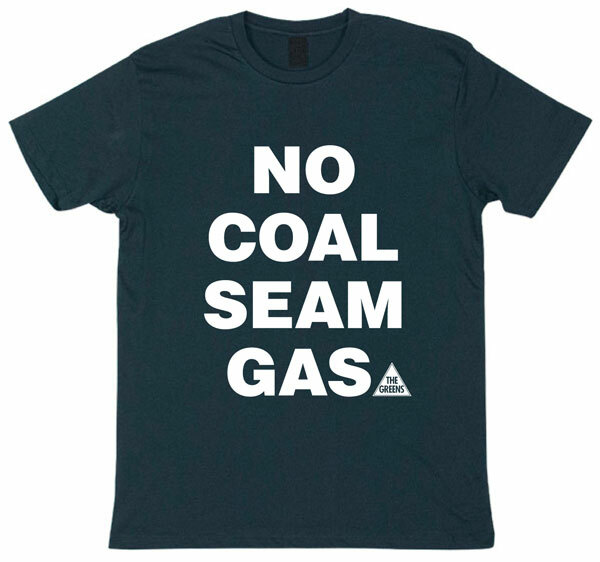 The Greens NSW are unequivocally opposed to coal seam gas and are the only party currently in Parliament advocating for a complete and permanent ban on this toxic industry. The Greens NSW have consistently argued and campaigned, both in parliament and with the community, against the roll out of coal seam gas and we will continue to do so until our land, water and communities are protected. Does your party support hydraulic fracturing (‘fracking’) in Gloucester, Pilliga or Camden? The Greens NSW want a complete and permanent ban on fracking because of the unacceptable risks it poses to our groundwater systems. There is mounting evidence from around the world that fracking can lead to contaminated and depleted aquifers and directly threatens the quality of water available for drinking or agriculture. The Greens NSW want the CSG operations at Gloucester, the Pilliga and Camden to be stopped immediately before any further damage is done to our land, water or communities. 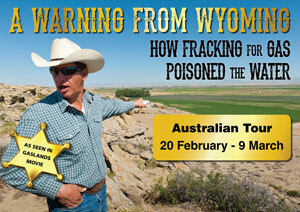 Do you have concerns about the health risks associated with CSG mining? 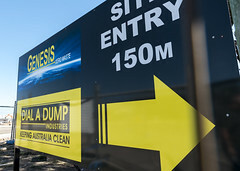 There is mounting evidence both in Australia and around the world that CSG mining presents significant risks to public health especially in nearby communities. The Greens NSW are concerned that the current level of assessment and monitoring of the health impacts of CSG is inadequate and this is backed up by groups such as the Public Health Association and Doctors for the Environment. We should be particularly alarmed that a recent article in the Medical Journal of Australia has made it clear that the health burdens of CSG “are likely to fall disproportionately on rural communities, the young and the elderly.” The Greens NSW believe that at the very least CSG should be prohibited within 2 km of all residential dwellings, water catchments, agricultural land and sensitive environmental places and that health impact statements should be mandatory for all CSG projects. Do you have concerns about the impact of CSG mining on water resources and agricultural land? The Greens NSW have stood with communities around the state in opposing the roll out of toxic gasfields. 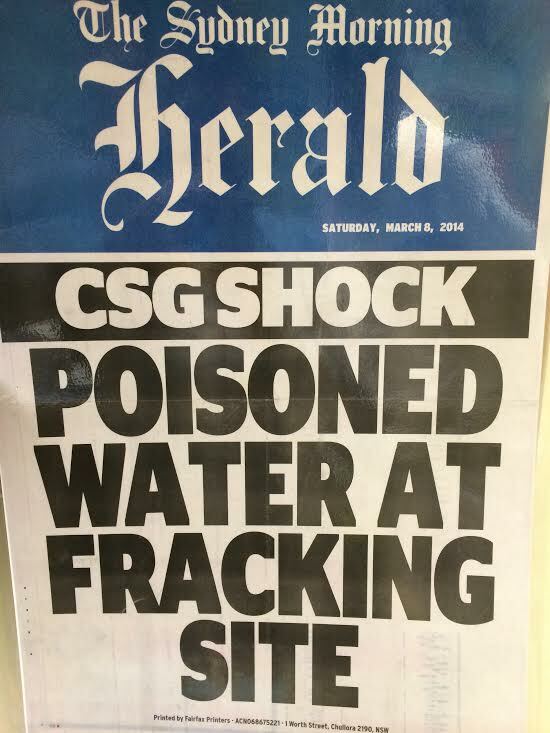 CSG threatens to pollute and deplete our drinking and agricultural water and we have already seen a number of serious pollution incidents, including one case where an aquifer in the Pilliga was contaminated with Uranium and other heavy metals. The roll out of CSG mining involves hundreds of wells and associated infrastructure taking over the landscape and will irreversibly change our farmland and rural communities. If you are elected, will you (and your party) support and campaign for a ban on CSG mining in Sydney’s water catchment? The Greens NSW have campaigned for the cancellation of all CSG licenses across Sydney and we have introduced legislation which would ban all mining, including CSG, within 2km of drinking water catchments including Sydney’s. We will continue to support and campaign for the protection of these sensitive areas. If you are elected, will you (and your party) support and advocate for a Royal Commission into the CSG industry to determine if it is safe? The Greens NSW believe that it is already clear that CSG is unsafe and should be permanently banned everywhere, however a Royal Commission would be an important forum to publically and forensically scrutinise the industry and as such we strongly support and advocate for the establishment of one. The Greens initiated and Greens MP Jeremy Buckingham was the Deputy Chair of two inquiries into coal seam gas in the last term of government. Will you (and your party) support the call for the license covering greater metropolitan Sydney (PEL 463) to be cancelled (extinguished) to provide certainty for 4 million people? The Greens NSW have campaigned and advocated at every opportunity, both in Parliament and the community, for this license to be cancelled and we will continue to do so. It is a sad indictment on the Labor Party that this license was ever issued and an ever sadder indictment on the Liberal and National Parties that they have not cancelled it in 4 years of government. To order a bumper sticker, simply click here and provide your contact details and the number of stickers you desire. If you would like more than 20 stickers to distribute, please contact my office on 9230 2202. Today’s Sydney Morning Herald is reporting on an email I sent to all local groups in the NSW Greens last week regarding a proposal to allocate significant parliamentary decision making powers to a small party committee. In the interests of transparency I reproduce that email below. I strongly support the democratisation of decision making in the Greens, but believe that reform should empower the grassroots membership of the party, not give significant powers to a small committee of insiders. Modern technology means we can efficiently empower and consult our membership on difficult or significant decisions. The Greens should be about participatory democracy, not delegating democracy to a small committee. I outline some ideas for reform at the end of the email. A proposal is coming to the SDC that will create a party executive and leave the Greens vulnerable to accusations that decisions are being made by ‘faceless men and women’. For many years there has been a debate in the party about whether we should give a Parliamentary Liaison Committee (PLC) the power to make decisions and direct the Greens’ Members of Parliament. Proposal GGDC 2 PLC Voting Protocols for decision at the coming State Delegates Council in Ballina on 6 December 2014 would enact such a power. This proposal would shift significant powers to a small group of party insiders who have very little accountability. This committee is not even mentioned in the NSW Greens Constitution, but would have the ability to direct members of Parliament how to vote on legislation. This proposal represents a fundamental change that undermines the principles of the Greens NSW, grassroots democracy and facilitates factionalism in the Greens. This proposal does not reflect the diverse views within the Greens NSW, the submissions to Governance and Grassroots working group, nor the range of views that were expressed at the workshop on the PLC held at the last SDC. While it may be superficially attractive to give a select number of ‘ordinary members’ the power to direct our MPs how to vote in parliament, it is in fact anti-democratic and presents numerous dangers for the Greens. When the Parliamentary Liaison Committee (PLC) was originally set up at the State Delegates Council (SDC) on 17 June 2000, the resolution specifically noted that “PLC be consultative and advisory only and have no decision making powers delegated to it”. For 15 years the role and need for the PLC has been debated in the party with a significant proportion of the party expressing concern at continual moves to make the PLC a powerful executive. The current proposal finally morphs the PLC into a powerful party executive or politburo. Creating a powerful executive is not consistent with grassroots and participatory democracy. This is particularly true when the democratic mandate and accountability of such an executive is extremely limited. If this executive is given the power to direct MPs how to vote in parliament, then (rightly or wrongly) we will face accusations from the media and the public about ‘faceless men and women’ running the party. Compare the democratic mandate of an MP compared to a PLC member. An MP goes through a rigorous pre-selection process where 3,000+ members can vote. They are then elected at a state election where millions vote. A PLC member is elected by a few votes cast by 30-40 local group delegates – the regional quota means a member can be elected with virtually no votes. In 2013 a PLC member was elected with only 3 local group delegate votes. While in principle local group delegate votes are meant to represent their local group membership’s will, the reality is many delegates are not instructed by their local groups how to vote and thus only a few individuals are making these decisions. Three people, or 1/1000th of the membership, could elect a PLC member. An MP has many forms of accountability. They are held to account through parliamentary processes and law. As public figures the media holds MPs to account. MPs are accountable to the PLC as it exists now, local groups, 6 SDC’s and an AGM. MPs are accessible to members of the party and the public. Ultimately, they are accountable at preselection and election time. The PLC is not mentioned in the Constitution of the Greens NSW and yet this proposal would give it more power than the Party Room. SDC elected PLC members have no accountability. Whilst the PLC covenor reports to SDC there is no reporting or accountability requirements for PLC members. There is no requirement they attend SDCs or even local group meetings. They are not public figures and are not easily accessible to members of the party or public. A Member of Parliament must abide by the parliament’s pecuniary interest requirements. Their financial interests and entitlements are publicly declared and can be audited by the parliament. They are likely to be investigated by the police or ICAC if they breach the requirements and rules of public office. A PLC member has no requirement to declare any interest nor any register of interests. Giving PLC members the power to determine parliamentary votes means that any conflicts of interest could have serious implications, not only in terms of the outcomes of parliamentary votes, but of public perceptions of the party. In short, creating positions of power without proper transparency and accountability creates a significant corruption risk. Creating the PLC as an executive effectively creates an alternative Party Room. It undermines the need for the Party Room to come to a resolution and consensus, as conflict can simply be referred to the PLC in the hope of a different outcome. There can be a high degree of complexity in analysing legislation, understanding the political context, parliamentary procedures, and stakeholder liaison. MPs work full time in their portfolios, have professional staff and create ongoing relationships with stakeholders, so to outsource the actual decision making to party volunteers with limited time is fraught. In my experience the PLC discussions are dominated by MP’s who have the expertise and invariably provide the background and context for discussions. The PLC risks becoming a forum for factional proxies to engage on behalf of MPs they are philosophically aligned with. As we have seen in the Labor and Liberal Parties, such committees can be used by the dominant faction to wield power and punish those of other factions or independents. While factionalism can never be eliminated, it is an increased risk when the selection of committee members is made by a small number of delegates at an SDC, rather than the broader grassroots membership at a preselection or plebiscite. The significant differential in the democratic mandate between an elected MP and a PLC member means that if the PLC tried to bind MPs to a certain position that some or all MPs were uncomfortable with, there may be a crisis and a damaging split. While splits can never be avoided entirely, having a split within a Party Room where the democratic mandate is equal is a simpler proposition than a split between groupings with different democratic mandates. Even if you ignore the issues described above and theoretically accept that a party executive is a democratically defensible proposition, there is still the issue of public perceptions. A party executive will be seen as anti-democratic by the public and will be seen as similar to the party machines of the Labor and Liberal Parties – which are largely resented by the public. Ultimately representative democracy is a public endeavour and our party’s power comes from the hundreds of thousands of people who vote Greens. To move the point of parliamentary decision making from a Party Room of elected MPs, to an executive of unknown party members will be met with great suspicion by the media and public. Inevitably there will occasionally be irreconcilable differences in the Party Room. The Greens’ model of consensus decision making, rather than simple majority decision making, means this problem is exacerbated. Creating a party executive simply shifts the exact same problem to a different grouping with less accountability and less democratic mandate. It is not a solution at all. A better model for resolving these differences is to empower and engage the grassroots of the party. We can do this with plebiscite votes of the membership, or quick decision making processes of local groups. Engaging the broader membership will provide the ultimate democratic answer to any question, without creating any crisis in legitimacy or accountability. Recently the party has conducted several party-wide quick decision making processes to gauge the membership’s position on issues such as blocking supply in the Senate and the Party’s position on the indexation of fuel tax. These processes were successful in engaging the broader party membership in debate, revealing the sentiment of the broader membership, and doing so quickly and relatively efficiently. Many members enjoyed and appreciated the experience of being consulted on these issues. With modern technology, quick decision making by local groups, or membership plebiscites can be done as quickly as convening a meeting of a committee. The PLC model of an executive committee is last century’s answer to party democracy. This century’s answer should be genuine engagement with the grassroots facilitated by modern technologies. Where the Party Room cannot form a position and the dispute is inter-personal in nature, it will be referred to the PLC for resolution with both PLC members and MPs participating in such a decision. Where the dispute is about interpretation of party policy, political strategy, forming a position on legislation, other parliamentary matters, or anything else, the dispute should be referred to the SDC, or a membership plebiscite or party-wide quick decision making process – depending on the urgency of the issue. Such a demarcation in decision making processes has already been discussed by the PLC members and MPs. It means the PLC can return to its original role of being a consultative and advisory body for MPs, while genuinely empowering the grassroots of the party with any difficult and major strategic or policy decisions. For ten years I have served on the PLC as an elected member and now as an MP and I believe it is undemocratic and unnecessary to create an executive when we should be exploring mechanisms that trust and empower the decision making with the grassroots of our wonderful party. Not content with introducing new laws which mean water management is based on old data and ignores climate change (see part 1 here), since becoming Water Minister, Kevin Humphries has also made it possible for illegal flood plain diversion works to be made retrospectively legal and ensured big irrigators will be able to claim compensation from taxpayers if these newly gifted flood water licences are ever revoked, cancelled or reduced. In August 2014, Kevin Humphries rushed the Water Management Amendment Bill 2014 through parliament. He hoped that no one would realise that hidden within the new laws were provisions which could allow any flood works (such as diversion banks which stop floodwater reaching a river) that were built after the 1994 cap on new works, to be made legal and the water these works capture to be made compensable. In other words, the laws could make previously illegal flood water diversions, legal. Up until recently water licence holders have not had a private access right to flood flow water, which has always been considered opportunistic water, but the legislation moved by Minister Humphries created a new category of floodplain harvesting license to provide these rights. It also allows the conversion of existing floodplain usage into these licenses and allows them to be compensable. This creates a new liability for taxpayers. Under questioning from my colleague in the lower house, Greens MP for Balmain Jamie Parker, Minister Humphries could not guarantee that diversion banks and other flood works created illegally after the 1994 cap on new works would not suddenly become legal and compensable. His carefully crafted words were: “these works are not illegal; they will be licensed.” That’s a bit like saying, ‘robbing the bank was not illegal, because I’ve just issued a licence to rob banks’. Legalising and issuing flood water licences will have significant ramifications for downstream users. Not only will it reward landholders who have undertaken illegal or inefficient works but is also likely to limit future opportunity to restore river flows, provide more water for downstream users, or restore floodplain health. Under the new rules, floodplain harvesting licence holders are eligible for compensation if their flood-flow water allocations are reduced, despite the fact that there is no clear basis yet on how to measure interests and values. Making these floodplain harvesting licences compensable is irresponsible as it will add additional costs to taxpayers in the future if water allocations need to be changed for a variety of quite foreseeable reasons. Minister Humphries and the Liberal and National Parties have clearly learnt nothing from past over-allocations of water licences and the gigantic call on taxpayers funds to then buy back licences to fix over allocation problems. When it comes to bad decisions about water management, Water Minister Kevin Humphries has form. 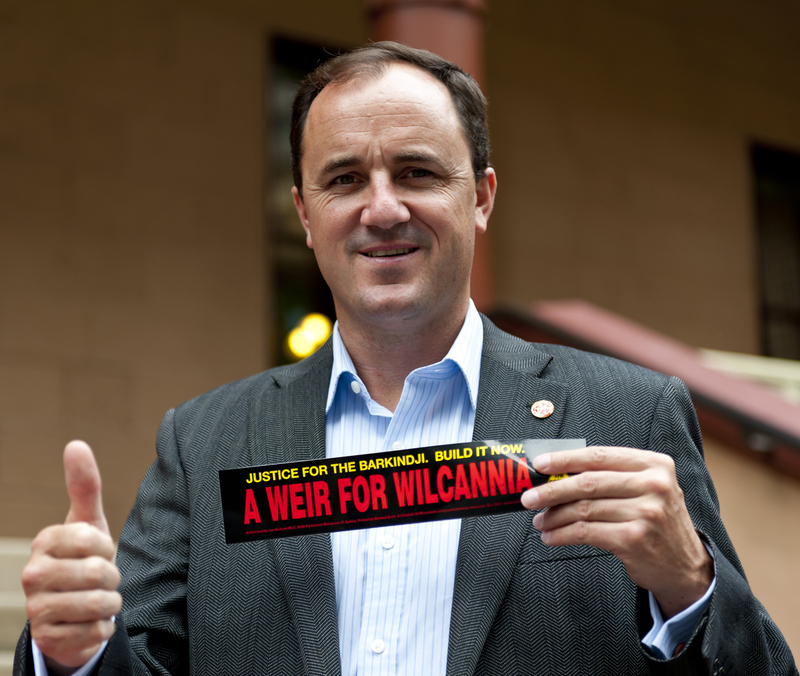 He recently rushed new laws (the Water Management Amendment Bill 2014) through parliament which allow more releases from storages like the Menindee Lakes by forcing the Office of Water to make their decisions on how much to release based on out-dated data that effectively ignores the millennium drought and future climate change. The impact of this change is to release more water in the short-term for irrigators, but potentially dams will run dry if a new drought hits because management decisions have to be based on pre-2004 data, and up-to-date data is ignored. It may deliver a boon for irrigators in the short-term, but it is an utterly irresponsible decision by Minister Humphries. He has deliberately stuck his head in the sand, but is leaving farmers and the cities, towns and villages of regional NSW extremely vulnerable. This reality is becoming stark with much of the state already in drought, water storages dwindling and with predictions saying a new El Nino is becoming likely.